I’ve just finished the second revision of chapter 1. Rewriting has started. I’ve decided to seed references to current events and see how they grow. My current reading helps me to stand back and reconsider. 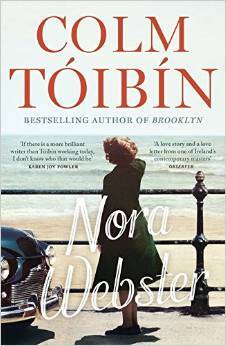 Having not read a book by Colm Toibin for some time, I decided I must try Nora Webster with others in my reading group. It was my turn to lead the discussion. I made my notes before reading any reviews online, and then looked them up. Most praised his style which I found too sober. I wanted to know the street and small town where Nora lived through more evocation of place, though there was a mist and some description of weather, particularly by the sea. The frequent visits to Dublin didn’t evoke the city for me either. Nor did I get much picture of what Nora, her family and friends really looked like. I couldn’t imagine them. Was it just me? Curiously, I was the only one in the group who didn’t know Ireland well. They knew the places and the coastline, so the setting was clear to them. One found Nora’s grieving for her husband reminiscent of her mother’s. She also lost her husband in early middle age and was left responsible for a large family. her papers around her. It was carefully placed so she could see her grand piano in a tastefully furnished room. I was prepared for the story to come out of this scene, and so it did. Densely written and clearly paced, it almost escaped McEwen’s tendency to show off his newfound knowledge – this time about the legal profession. Was it in Saturday that I jumped meticulous descriptions of brain surgery? Or with Balzac – was it in Le Père Goriot that I jumped pages and pages, or so it seemed, of descriptions of perfume bottles? He also avoided his tendency to have a violent event, described in detail, about two thirds into the narrative. I was caught in the weave of the book: strands of life in court with an array of colleagues to the hospital, the Jehovah’s Witnesses, the young man refusing blood transfusions that would save his life through pure or blinkered belief, and the interplay of young and older lives. Until I had jaundice I used to donate blood because I have a rare blood group. I never thought that someone could refuse a life-giving transfusion because it is someone else’s blood. Menstruating women must renew their blood every few years, but men don’t. What about a heart transplant? A friend of a friend of mine has had an amazing triple transplant – heart, liver and kidneys. Twelve years later, on holiday in France, he had an accident. The French hospital was immediately in touch with the one in England where the transplants took place, and all was resolved. Amazing, almost miraculous modern surgery. What I love about both books was the role great music played in the conclusion, for both Nora and Fiona. It’s some time since I wrote the ending to my current novel; music has a role there too.